These sinks cannot be used as a dishwashing area, as they don’t have the number of compartments needed to complete the washing process by FDA standards. Best for small kitchens, utility sinks, hand washing sinks. With two compartments, you’re able to utilize these sinks for food thawing and preparation purposes (but still not dishwashing). Best for thawing food, preparation, vegetable cleaning, meat thawing. Note! You can’t use the same sink for Veg. and meats because of cross-contamination. The traditional favorite, a three-compartment sink can rinse, wash, and sanitize dishes, is intuitive to use, and has a relatively compact footprint. Best for dishwashing (rinse, wash, sanitize). If you’re not scraping for space in your kitchen and tend to have a lot of dishes to clean (or don’t have a dishwasher), then a four compartment sink can fit into your operation seamlessly. Best for dishwashing (scrape, rinse, wash, sanitize), large kitchens with room to spare, extra compartment allows utensils and smaller items to be segregated. Hand Washing Station: These can come in small, single basin models or can stretch to accommodate many users (while still utilizing a single basin). Prep Table Units: Rather than purchasing a small, single-basin sink to bump up alongside your prep area, you may opt to invest for a full-sized prep table unit with sink. These are best for bigger operations and institutions. 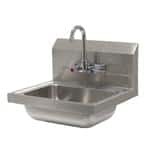 Drop-In Compartment Sinks: These are best suited for those who have invested in a worktable with space to accommodate a drop-in sink unit, helping to mesh equipment into a smooth, seamless kitchen flow. Portable Soak Sinks: Do you have large items that need pre-soaked before washing? Portable soak sinks are ideal for prepping items like mixing bowls for dishwashing. Compartments specifically for sanitizing can work with chemicals or a hot water heater (Wells, Hatco) that could be built in. The gauge of your stainless steel basically describes the thickness and, thus, the durability of the steel itself; the lower the gauge, the thicker the steel! Lighter and less expensive than 16 or 14 gauge, these are often known as «budget tables» and work best as workstations with light duty. This gauge is not ideal heavy weighted items as it dents and bends easily. Best for not recommended for sinks. As a traditional choice cutting the middle between affordability and durability, 16 gauge is generally fit for most needs. For those who want a sink that can stand up to heavy use. Often the sink of choice for larger operations. Best for meat prep, institutional. The different types of stainless steel are determined by the crystalline structure of the steel itself. The differences in structure can determine the steel’s durability and resistance to corrosion. 304 – More expensive but higher quality (and what we recommend). Virtually stain/rust-proof. Will clean easily. If you are in a very humid environment or very close to the seashore, then you should go with all stainless steel and preferably 304 to make equipment last longer. Drainboards on one or both sides: With drainboards flanking your sink, you can dry dishes or simply have extra table space. Some drainboards come pre-installed while others can be added to your existing unit. Drilled Holes: In the backsplash, holes can be drilled to accommodate nozzle, gooseneck, or pre-rinse faucets. For 4-compartment sinks, you may find that there are several centers to allow for multiple faucets across the sinks. Sink Covers: If you don’t want one of the basins to be in use for any given purpose, then a sink cover does the job of concealing a basin without obstructing the entire use of the sink itself. Spray rinse and other faucets: Some sinks come with holes for multiple faucets and some with only one set. Consider the reach of the faucet and if you want to have a separate spray rinse in addition to a faucet. Flange feet are screwed into the floor and prevent to sink from being bumped out of position (which could cause utility connection breaks). Lever wastes allow for the drain to be opened or closed easily from the bottom of the sink. Compartment Sinks: The FDA Code requires a backup plan should your dishwasher ever fail, and this typically involves a three-compartment sink. The biggest factor in choosing a compartment sink is that your largest utensil or pot should be able to be fully submerged in a compartment. This comes into play especially for bakeries or restaurants that utilize large mixing bowls! The three compartments are separated for washing, rinsing, and sanitizing, and you’ll invest in the right chemicals for the job. Prep Area: You cannot use the same sink for washing food as you use for washing dishes, so you’ll need a separate sink near the prep area for washing food before using! This keeps the chemicals for washing dishes separate from food that you plan to serve to guests, as chemical contamination is not only foul but also a safety hazard. You can also fill pots to prep food such as kettles and steamers. Many municipalities require a two compartment sink for food prep. You can also invest in a prep table/sink combo to get the best of both worlds in one piece of equipment. WE RECOMMEND THAT ALL FOOD SERVICE EQUIPMENT - ESPECIALLY SINKS - HAVE AN NSF (National Sanitation Foundation) STICKER. Inspectors will look for it.